The new Lehrter Bahnhof in the heart of Berlin – near the Reichstag – is being constructed as one of the largest stations in Europe with a very futuristic design. In its centre there is a large entrance hall at road level. A system of four partly pre-stressed concrete bridges for east-west railway line on a level of about 10 m above road level crosses the hall. The north-south railway line runs underground at about -15 m. In order to bring sunlight to the underground level the central station area does not have continuous floors but is open. For this reason, the railway bridges in the hall area are sup-ported by 23 m high slender steel columns, which are Y-shaped (fork-shaped) at their tops. The super-structure of the Lehrter Bahnhof, especially the wide-spanned glass roof consisting of almost 11,000 panes of glass and spanned over the four pre-stressed railway bridges make it particularly sensitive to settlement. 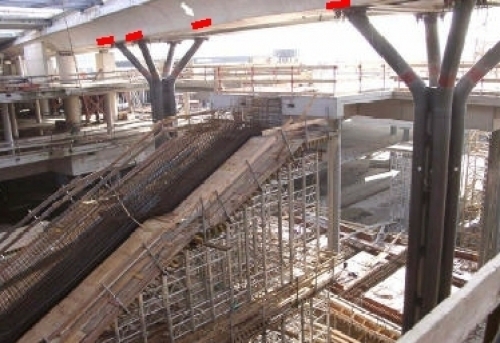 Vertical displacements of adjacent piers should not differ by more than 10 mm. Construction activities in the immediate vicinity, especially dismantling of the old station building along the new track, cause settlements or heaves at the numerous piers which induce excessive deformations into the building. 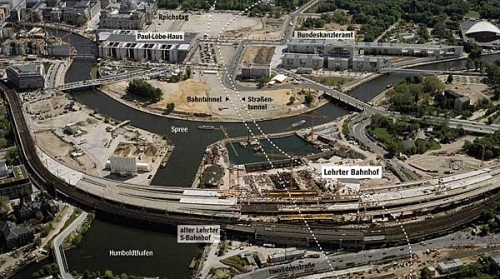 Because of these activities and the difficult nature of soil in Berlin – mostly sand – the structure has to be monitored during construction, commissioning and for the first few years after loading. Corrective decisions can then be made, i.e. raising or lowering the bridges at the supporting points, depending on measurement results. Common geodetic measurement of settlement and heave at the piers cannot be repeated at sufficiently short intervals due to time consuming procedures and limited access to measurement points. By using continuous monitoring techniques it is possible to discover deviations from the expected structural performance or damage in time. On the other hand, corrections or optimisation of materials used are possible. Co-operation amongst the experts in the field of sensor technology and structural engineering has been most productive. All co-workers made important contributions to the long-term use and safety of structures in the field of transportation. Especially, parallel long-term tests on large concrete beams are suited to give important information about safety of large structures and reliability of measurement data. This is the only way to get reliable and early information about the state of the building and to understand the relation to what happens in the environment of the site. 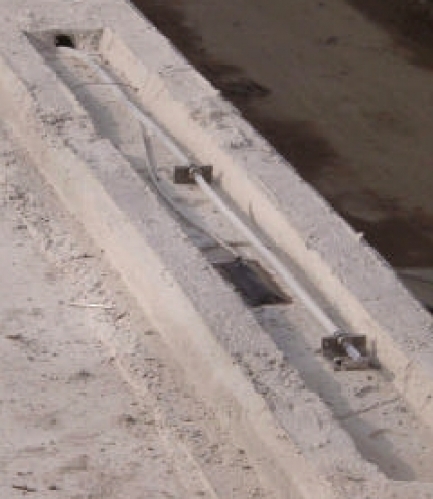 SOFO sensor in a depression on the concrete surface before embedding.